There's no question about it -- running is great exercise. But if you're having trouble getting to the next level, you might not know what is holding you back. These training tips should help any runner go the extra mile. Your body's natural response is to hold a lot of tension in your upper body. This little reflex makes even the shortest run feel exhausting. By loosening up your hands, you can allow yourself to run faster and longer, without as much fatigue. Not sure if you're tensing up? Put a rolled piece of paper in your hand during your run. If after a couple of minutes it's crunched, you're squeezing it way too hard. One of the staples of training for runners is to get a good pair of shoes and replace them regularly. While that will do a great deal to take care of your feet, even the best shoes can't protect them completely. Running can do a great deal of damage if your feet aren't taken care of properly. One of the best ways to give back to your feet is to gently massage them. Place a small ball, about the size of a golf ball, between your foot and the floor, and roll it from the heel to the ball. Repeat this every morning and night for 30-60 seconds and your feet will thank you. A major part of training for runners is to figure out how you can run more efficiently, leading you to faster times and longer distances. Luckily, that's exactly what our brain is trying to do every time we hit the pavement. Because we're getting this mental workout every time we train, making sure that you run regularly will always lead to improvement over time. But it's possible to "trick" your brain, speeding up this process. You don't want to overtrain-- this can lead to injury and burnout. Instead, consider a fast finish. Ratchet up your speed for the last 5 to 10 minutes of a long run, and you'll find that your improvement will become noticeably faster. While many runners focus on the motion of their body, too few think about the impact their breathing has on their performance. When you breath too much, you don't get a chance to expel all the carbon dioxide in your lungs. Part of training for runners should include focusing on their breathing. If you can manage to slow your breathing, you'll find that you run more efficiently. Consider using breathing techniques other times, too. Many athletes practice meditation in order to help them relax and gain better breathing habits. Training for runners should train as many muscles as possible, in order to further increase stability, support, and strength. One of the easiest ways to do this is to run in different directions. 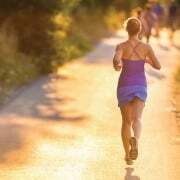 Try running backwards or sideways as part of your regimen. You'll hit all sorts of muscles you wouldn't normally exercise, and build core strength as well. Whether you're new to running or simply want to get more out of your routine, these training tips should help you maximize your potential. If you need help with a run training program, visit our CalFit Active page for program details.